Scientists and technicians scanning the rocky ocean floor off Southern California couldn't contain their excitement when they spotted a bright-purple, googly-eyed stubby squid. They let out a collective "whoa" on video posted on the Exploration Vessel Nautilus' Facebook page as a camera on a remote-operated vehicle came across the iridescent cephalopod with giant round eyes. "He has weird eyes!" said one enthusiastic observer. "Get close! Get close!" urged another. One suggested it resembled a child's dropped toy, and another said the creature's eyes appeared to be painted on. "It looks so fake," said one member of the Nautilus' team. The creature looks like a cross between a squid and an octopus but is closely related to a cuttlefish, according to the Nautilus Live website. The find could be more than just bemusing. "In addition to the googly-eyed cuteness, there is one thing biologically interesting about this observation," said cephalopod expert Michael Vecchione of the Smithsonian Institution. The creature could be a new species, he wrote in an email to the expedition. It was spotted at nearly 3,000 feet deep, which is unusual, but not unheard of. But, on top of that, the stubby squid didn't have chromatophores, cells that allow it to change color, as members of its species do, Vecchione said. The question can't be answered because this particular stubby squid remains deep in the ocean, out of scientists' reach. 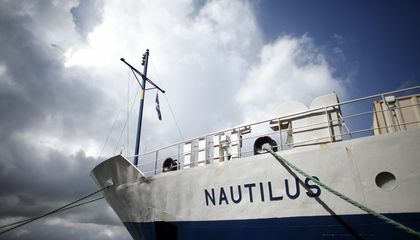 The Nautilus team is part of a four-month Ocean Exploration Trust expedition to map underwater fault zones from Canada to California and understand ecosystems around them. The team spends hours scanning the barren ocean-scape, "then to come across something adorable like that - it's a real treat," Exploration Vessel Nautilus spokeswoman Susan Poulton said. US women's gymnastics team flips over Broadway's "Hamilton"
I wouldn't say this creature is adorable. One reason is because its huge eyes. If we were talking about something adorable it would be like a little puppy and this creature is nothing close to being as adorable as a puppy. It's not even on the side of being a pretty animal. If I did have to list one reason it was adorable then i would have to say its small body compared to its big head. The big eyes on the squid are adorable because they remind me of puppy dog eyes. The color is cute and kind of feminine because it is purple looking. The size of the little creature was adorable because it was tiny. It reminded me of the little octopus on Finding Nemo. This article was cool because we might just have a new found species and it was an adorable looking squid. Many viewing the squid may think it looks unreal, and more like a stuffed sea animal rather than a creature actually living in the depths of the ocean. Until more information is uncovered about the cute tiny squid, people will continue to think of it as an adorable animal instead of another standard sea organism. the eyes make this creature adorable. the eyes are the center of attention on the squid and everyone loves a good pair of eyes. they say the squid looks like a plush toy and all plush toys are all adorable and thats what makes this squid adorable. 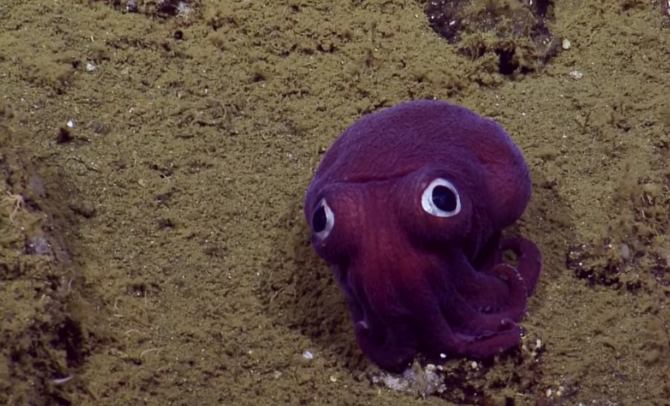 A stubby squid was found on the rocky ocean floor of Southern California with big googly eyes. Everyone then began talking about how it looked fake, almost like a child's toy. One fact about the interesting creature is that it might be a new species. This is so interesting. I have a real fascination with aquatic life so this article really did interest me because it is always good to make new discoveries like this. It will be interesting to see what is this squid actually like then what is believed to be. It is a neat ocean creature that we need to find out more on. I agree it does look like a child's dropped toy! It's very cute with the big eyes and with the purple color of its skin on the outside. It looks like something off of finding nemo! Also I cant believe it was found about 3,000 feet deep that's very rear and odd. I hope hey find for and breed it so we can have more of those part squid and part octopus in our lives!